I have to admit that the plot presented in the trailers of this movie intrigued me. However, in its execution, Passengers (2016) left much to be desired. Of course, this was mostly due to the film using just enough “physics speak” to be partially accurate, but incredibly wrong. Those parts stuck out to me in this movie and I kept scratching my head while watching it and saying, “Wait a minute . . .” That being said, not all of Passengers was bad, just a pretty big chunk of it. I did appreciate the moral conundrum that Jim (Chris Pratt) encountered in the movie’s first act. It did add a bit of predictable drama to the characters, but depicting his struggle highlighted his humanity. In this plot with a clear three-act structure, this first act was the highlight that eventually devolved into a ridiculous setup for the final reveal. With each new character introduced, the tension increased in each act. And yet, I wondered if the spacecraft could have even survived that long given the issues it had. In a story that initially felt like The Martian (2015), with bits of WALL-E (2008) mixed in (especially with Thomas Newman’s musical score for both Passengers and WALL-E), the scientist in me could not ignore a few key aspects of this film. First, a simple Wolfram Alpha search will tell you that it would take 73 years to reach Arcturus at ½ light speed, not 30. Second, for a spaceship that is rotating, why would it need to have a separate “gravity drive” to keep things in place (other than to make me wonder why the gravity was strangely perpendicular to the rotation)? Finally, the spaceship was clearly accelerating the entire time, so I wonder if the ½ light speed velocity was at that point or during the whole duration of the current flight. All glaring disobediences to the laws of physics. 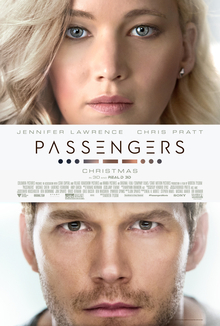 An excuse to have Chris Pratt and Jennifer Lawrence star in a movie together, I give Passengers 2.5 stars out of 5.